A mandarin ducks pot is a kind of hotpot with two separate soups: spicy and clear. Chinese hotpot (火锅 huǒguō /hwor-gwor/ &apos;fire-pot&apos;), also known as Chinese fondue, is one of the most popular meals in China. It consists of a simmering metal pot with broth at the center of a table, and all raw ingredients placed beside the metal pot, so people can add and cook whatever they like in the broth. The hotpot has a long history of over 1,000 years in China. It used to be favored only in winter, but recently hotpot has been appearing on tables all year round. Beside the delicious flavor, there are two other important reasons for Chinese liking hotpot: the first one is that it is a great way to socialize. People gather around the pot, chatting, eating, drinking, and having fun. The other is that hotpot is a "healthy meal". Boiling is better than frying, and bone nutrients are released into the broth. Eating hotpot can warm the body and improve circulation in winter, and increase perspiration to help cool the body in summer. Some seasonings used in hotpots can help alleviate some minor illnesses like colds, blocked sinuses, and headaches. There are several varieties of hot pot in China with differently flavored broth. 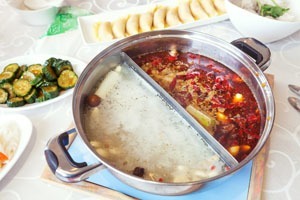 Two of the most popular hotpots are Sichuan hotpot and Beijing mutton hotpot (instant-boiled mutton). Some other popular hotpots include seafood hotpot in Guangdong, sauerkraut hotpot in Northeast China, chrysanthemum hotpot in Suzhou and Hangzhou, and beef hotpot in Hong Kong. Sichuan hotpot is the most famous Chinese hotpot. Now it is very popular and can be found in almost every city in China. 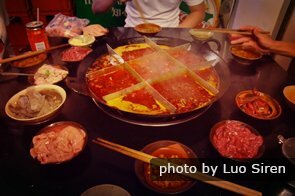 Sichuan hotpot is famous for its numbing and spicy flavor, resulting from a special seasoning — Sichuan pepper (花椒 huā jiāo /hwaa- jyaoww/) — and other spicy ingredients like chili added to it, which marks its difference from other hotpots. There are various of Sichuan hotpots, based on different broths and meats, so Sichuan hot pot suits customers of different preferences: salty, sweet, or sour flavors all are available. If you want to challenge your taste buds, Sichuan hot pot is highly recommended. Beijing instant-boiled mutton, also called mutton hotpot, is regarded as the representative of the northern China hotpots. The main ingredient is mutton, and the broth is made of nutritious sheep-bone stock, with shallots, ginger, mushrooms, Chinese dates, wolfberries, longans, and dried seafood (shrimps, fish, ...). When you eat a hotpot in a restaurant, generally, there are two types of soup base: spicy and clear. A clear soup base has a mild flavor made by cooking seafood, or meat bones like chicken or spareribs with ginger or other lighter seasonings. 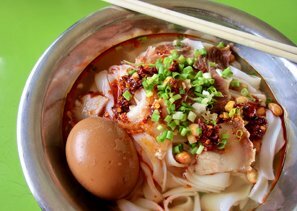 A spicy soup base usually has Sichuan pepper, chilies, red chili oil, etc. If you have a mixed group with some who don&apos;t eat spicy food, there are special pots with a divider in the middle, between the spicy and clear soup, which is called a &apos;Mandarin ducks pot&apos; (鸳鸯锅 yuānyangguō /ywen-yang-gwor/). Mutton rolls. Mutton is one of the most popular hotpot ingredients. 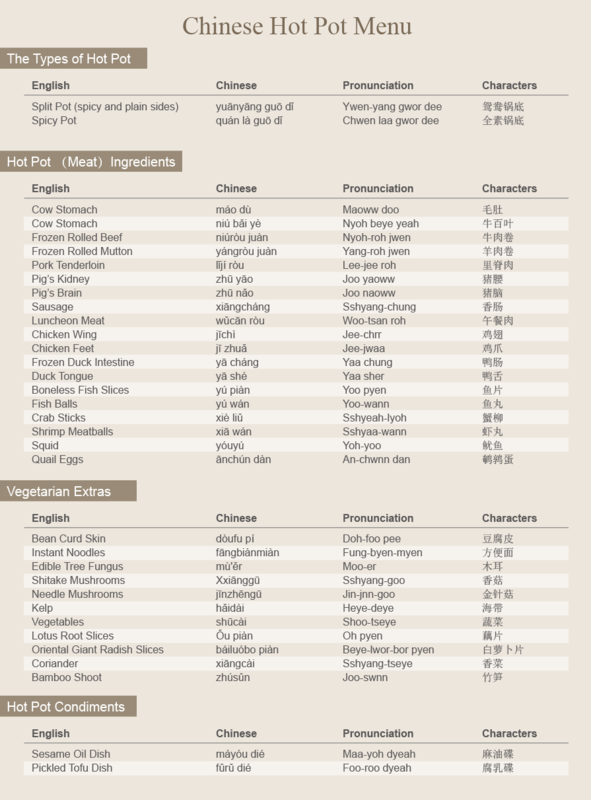 There are various ingredients used in hotpots. The meat can be beef, mutton, lamb, chicken, duck, fish, prawn, etc., but not pork if you are in an Islamic restaurant. Vegetarian ingredients such as mushrooms, (sliced) potatoes, cabbage, and tofu can be quick-boiled as well, and are favored by many, particularly Chinese women who want to eat less cholesterol. Of course, you can also try whatever you like. The ingredients are usually served with dipping sauces, made by mixing your choice of sesame sauce, chili oil, soy sauce, garlic sauce, vinegar, pepper sauce, seafood sauce, green onions, etc. You can choose what you like to fit your own taste. Cook ingredients thoroughly before eating. Although the flavor of Chinese hotpots varies from region to region, they have similar dining customs. Hotpot is commonly served in a wide metal pot/wok over a (gas) burner, or a recess in the table in which e.g. charcoal burns, to heat the soup in the middle of at a table. When the broth is boiling, you may dip (quickly-cooked) ingredients in until cooked with your chopsticks (if you don&apos;t want to lose them to the communal pot). Adding ingredients: Do not add all ingredients to the soup at once. You should add the items that take longest to cook first, like fish balls and meatballs, and then add/dip the thinly sliced meats or green vegetables. Make sure foods are cooked through before you eat. For example the meat balls and fish balls need to float, and the raw meats need to fully change their color. Then you can use the dipping sauces. There are numerous hotpot restaurants in China. The following restaurants are the most famous brands in China, serving the most authentic flavors of their own hotpot type. They have lots of branches in most big cities of China (including Beijing, Shanghai, Xi&apos;an, Chengdu, Guangzhou, and Zhengzhou) and can be found easily. They are Haidi Lao, Huangcheng Laoma, Tan&apos;s Fish Head, and Little Sheep. 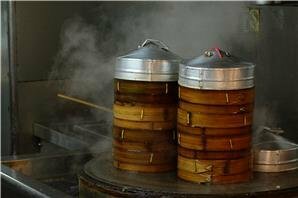 Hai Di Lao is a chain of hotpot restaurants founded in Sichuan Province in 1994, specializing in Sichuan hotpot. 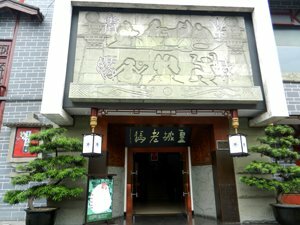 Huangcheng Laoma Restaurant, one of the most famous traditional hotpot brands in China, is regarded as a worthy representative of Sichuan culture and cuisine. Tan&apos;s Fish Head, founded in Chengdu, Sichuan Province in 1996, is well-known for its delicious fish head hotpot. Little Sheep, founded in 1999 in Baotou, Inner Mongolia, specializing in mutton/lamb hotpot restaurants, has over 300 chain restaurants in China. Our customers are learning to cook a hotpot. Three major elements make up a hotpot: the broth, the sauces, and the choice of ingredients to add to the broth. 1. Prepare the broth by stewing bones with seasonings (like salt and ginger) until the flavor of the meat and seasonings are fully infused in the liquid. 2. 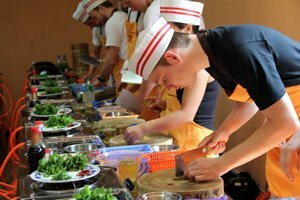 Thinly slice a variety of meats or seafood you enjoy, and prepare any vegetables and other ingredients you like. 3. Make up dipping sauces using sesame sauce, chili oil, soy sauce, garlic sauce, vinegar, pepper sauce, seafood sauce, green onions, etc. 4. Place a magnetic heating plate or gas burner in the middle of the dining table and heat the broth. 5. When the broth comes to the boil, add the ingredients in the pot to cook and enjoy the hotpot. Our customers are enjoying their food with our colleague Kim in a Chinese restaurant. If you want to try Chinese hotpot, our tours can take you to authentic restaurants. 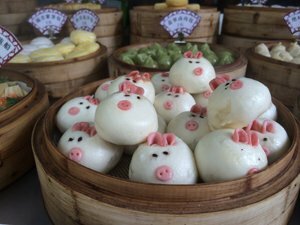 Our Chinese Food Tours combine must-see attractions in China with meals in carefully selected restaurants. Or you can contact us and we cantailor-make a tour for you according to your requirements.